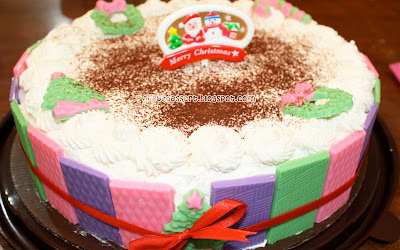 Ini adalah tiramisu andalan yang bikinnya ngga pake telur, jadi aman hehehe.... Bikin ini buat dikasiin waktu Natal kemarin, terus bikin buat sendiri juga tapi di taruh dalam mika kecil2.. hasil nemu di Ny.Liem hehe.. Untuk sponge lady finger nya tentu aja beli jadi aja yang gampang, mumpung sekarang banyak di jual di TBK ataupun supermarket2 di Bandung ini. 1. Lightly grease and line a 900 gr loaf tin with clear film (plastic wrap). Put the mascarpone and sugar in a large bowl and beat for 1 minute. Stir in 30 ml of the coffee and mix well. 2. Whip the cream with 1 tbsp of the liqueur until it forms soft peaks, stir a spoonful into the mascarpone, then fold in the rest. Spoon half the mixture into the loaf tin and smooth the top. 3. Put the remaining strong brewed coffee and liqueur in a shallow dish just wider than the biscuits, dip one side of each biscuit into the coffee mixture, then arrange on top of the mascarpone mixture in a single layer. 4. Spoon the rest of the mascarpone mixture over the biscuit layer and smooth the top. 5. Dip the remaining biscuits in the coffee mixture and arrange on top. Drizzle any remaining coffee mixture over the top. Cover the dish with clear film and chill for at least 4 hours. Carefully turn the tiramisu out of the loaf tin and sprinkle with grated chocolate and cocoa powder, serve cut into slices.